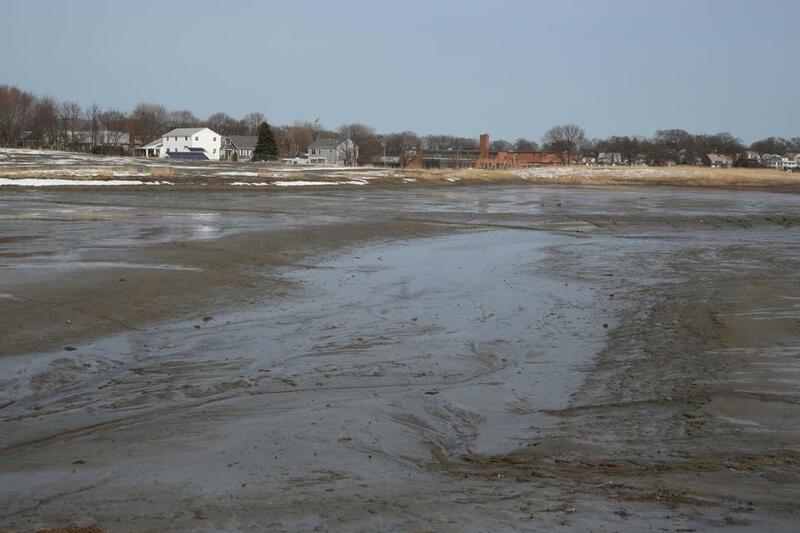 Broad Meadows Marsh in Quincy as it looked this month. Once a nondescript stretch of land covered by an invasive weed, Quincy’s Broad Meadows Marsh at the base of the Town River now boasts a waterfront view. Gone are the tangled vegetation and dry mounds of dirt, replaced by mud flats and saltwater inlets brimming with tiny ecosystems. For many, the $6 million marsh restoration project is already a success. Yet as the project nears completion, there is still debate on how exactly to turn it into a community asset. 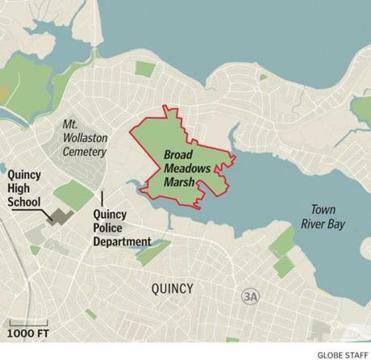 The project — whose funding includes a $4.6 million grant from the US Army Corps of Engineers, about $1.4 million from the city, and $150,000 from the Neponset River Watershed Association — is a return to the beginning for some of the 106 acres of marshland that were essentially ruined by misguided engineering, a common occurrence in the early- to mid-20th century. The big problem was that dredged material from the Town River was placed in the marsh twice, in 1938 and 1956, to make the river more passable for boats. In subsequent years, 41 acres of land, contained within the loop of Southern Artery and Sea Street were developed. One section turned into the Department of Public Works’ rear yard. Other areas now contain Broad Meadows Middle School and the Quincy Youth Arena. The remaining land was seeded with what was thought to be a common reed plant – phragmites – to control erosion. Yet the invasive plant took off, turning what was a once bountiful waterfront into what looked like a field of wheat. By 2010, the city had negotiated with the Army Corps to restore 31 acres of the site to marsh conditions, and work soon began on digging up about 400,000 cubic yards of fill, which would be placed elsewhere on the site to form a grassy hill. Despite permitting issues, funding problems, and design setbacks, the marsh restoration process is nearing completion. According to Gendron, most of the phragmites are gone, and saltwater has been flowing freely in with tidal cycles since the estuary was reestablished in December 2011. In the immediate future, the Army Corps will continue to work on restoring coastal plants, a process that has proven difficult due to the acidity of the soil, Gendron said. While that process is ongoing, engineers will take down their construction fences sometime in the early summer, which would open the site to the public. Yet visions vary for how the public will interact with the site. Laforest hopes to turn the marsh’s upland areas mainly into a public space for passive recreation. “I think it’s great for Quincy to have a waterfront park for people who want to be out and walking and appreciating our environment. It’s quite the site,” she said. Access will be the main sticking point for the councilor and her constituents — determining which neighborhoods will bear the burden of a through-way, and where to establish walkways. For others interested in the marsh, hopes are even higher. Foley pictures coastal plants bordered by cedar trees, which were once farmed on the site by John Adams. Funds from the Community Preservation Committee could pay for the feet of topsoil needed for the plantings, and the town’s compost pile could help make the site lush for growth, he said. Foley’s vision goes even further than the green grassy hill ripe for tourism; he hopes to see the delicate, fascinating ecosystem used as an educational tool. Quincy could even partner with a variety of agencies. Coastal America, an environmental group focused on coastal areas, could build a science center on the site and better engage Quincy youths in the area’s development. The city could also join with the Massachusetts Marine Fishery Institute to bring a fish hatchery to the water — increasing the fishing stock and cutting down on mosquitoes. For city officials, the vision includes foot paths and determining what type of recreation — from kiting to kayaking — should be encouraged. Those discussions are ongoing with the Army Corps, said mayoral spokesman Christopher Walker, and will be nailed down in the next few months and will include elements of park space. “Walkways yes, some grading and planting of seed and plants, and all those components anyone would consider part of a passive open space will certainly be factored into the planning,” Walker said. More expensive, long-term options — removing the utility lines that run through the property, excavating more of the wetlands, and installing floating walkways — will be factored into planning, but might not be realized for some time to come. While much is still in flux, Walker said the project has already accomplished much of what it set out to do. Birds and invertebrate creatures have returned to the marshlands, and most of the phragmites have been suffocated with dirt or killed with the saltwater tides. A side benefit, Walker noted, is a reduced threat of brush fires. Moreover, the restoration will be a counterweight to the transformation of the downtown, and will mean a cumulative transformation of the city’s biggest draws. Jessica Bartlett can be reached at jessica.may.bartlett gmail .com.